SAO PAULO: The still-unfinished stadium hosting the World Cup opening game on June 12 held its first official match Sunday, getting off to a shaky start after delays and deadly accidents marred its construction. Sao Paulo's Corinthians Arena -- over-budget, under construction and operating at less than full capacity 25 days from football's largest showcase -- hosted a Brazilian league game in which underdogs Figueirense upset home team Corinthians and rain drenched fans left exposed by the unfinished roof. The soaked fans sought cover in higher rows, which had not sold out, as they watched their team lose 1-0 to the lowest-ranking side in the table. About 36,000 fans turned out for the game -- less than the 40,000 tickets that were on sale, and well below the 68,000 expected for World Cup matches. Cell phone communications were all but impossible during and after the match because the 3G network was saturated, said an AFP photographer, though wi-fi was working inside the stadium. The venue and surrounding area still look very much like a construction site, with cranes and scaffolding visible and some VIP areas unfinished. Long lines formed at the entrance to one wing of the stadium, where only half the four elevators were working. After the match, there was not enough light for fans to find their way to their cars, leaving them to use their cell phones as flashlights. The security perimeter around the stadium was also smaller than that required by FIFA, and metal detectors demanded by the world football governing body were not yet installed. According to Globo newspaper, parts of the stadium will not be finished for the World Cup opening ceremony and kick-off match between Brazil and Croatia, notably portions of the sprawling glass roof. Fans with central seats near the pitch -- meant to be some of the best in the house -- would do well to bring their umbrellas. FIFA originally demanded Brazil have all 12 host stadiums ready for December 31, but deadline after deadline has passed and eight workers have been killed in construction accidents. Three of those deaths were in Sao Paulo, Brazil's economic hub. Two workers were killed on November 27 when a crane came crashing down on them, a third on March 21 when he fell while working on one of two extra seating areas. The labor ministry halted work on those stands after the accident, demanding safety improvements. Work resumed two weeks later, but the seating areas -- designed to hold a total of 20,000 fans -- have still not received safety approval from firefighters and were not open for Sunday's match. Sao Paulo was picked to host the World Cup kick-off in October 2011, four months after work started on the stadium. The Itaquerao, as the venue is known, will host six World Cup matches in all, including a semi-final. After numerous delays, the stadium is now due to be handed over to FIFA Wednesday, nearly five months behind schedule, without having held a capacity crowd. Corinthians say the stadium will end up costing between 920 million and 950 million reais ($411 million and $424 million) -- between 14 percent and 18 percent over its original budget. 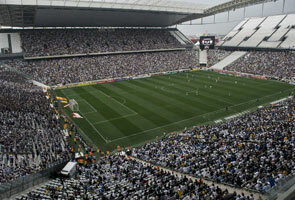 Construction group Odebrecht officially handed the keys to the stadium to Corinthians on April 15. A visibly agitated FIFA secretary general Jerome Valcke said during his last visit to the stadium, on April 22, that the venue would only be ready "at the last minute." The fatal accidents have not been the only reason for the delays, Corinthians construction manager Andres Sanchez admitted in a TV interview last month. "We and the builder left a lot of things until the last minute," he said. A former chairman of the club, he also said if he were in FIFA's place he would regret awarding the World Cup to Brazil, which has also been hit by protests against the more than $11 billion being spent on the tournament. But despite controversy, rain and defeat, Corinthians fans were determined to celebrate. The 104-year-old club had been waiting for their own stadium since 1940, when they began renting a municipal stadium because their crowds had grown too large for their previous home. Corinthians, one of Brazil's most popular clubs, say they have 30 million fans worldwide.